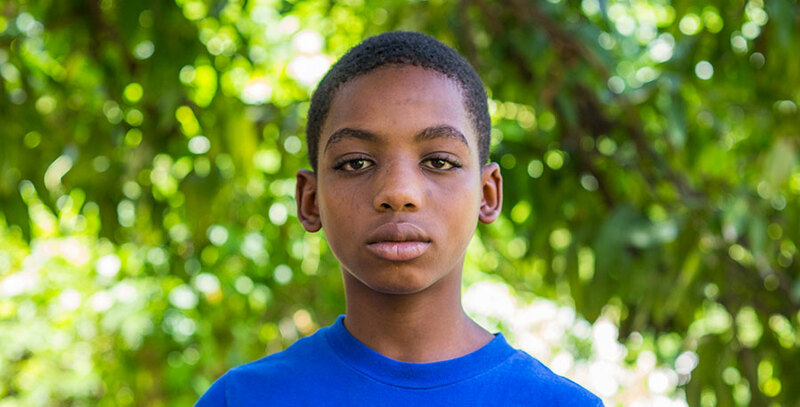 James is from the village of Les Cayes where his mother and father live. He has one sister who also lives in Port au Prince. His mother is a teacher in Okay, so James understands the importance of school; he studies hard. He would like to be an engineer when he grows up to help create new things. He knows school is important to achieve this career. He likes music and tries to play the trumpet from time to time. Here at the orphanage he has the opportunity to learn some music, which he really likes. He loves to watch movies which makes our movie nights a fun activity for him and his friends. His best friends at the orphanage are Franklin, Peter and Woody. Franklin loves learning about Jesus. When asked what he knows about Jesus he says that he is sure of one thing: Jesus created the earth and heavens and the clouds and the moon and the sun and he put animals on the earth and created human beings.